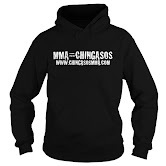 March 2014 | MMA Fighting Events Videos Techniques UFC Fight Picks and News. When the bell rang to end the fifth round at UFC 167: GSP vs. Henricks, most people felt that George St. Pierre (GSP) had been dethroned and that the UFC would have a new welterweight champion. When the judges decision came in, the world was shocked that GSP was given the victory. Even though Johnny Hendricks officially lost the decision, he retired GSP that night, and became the peoples champion. At UFC 171, he gets the chance to officially take possession of the welterweight champion when he faces Robby Lawler for the vacant championship belt that GSP left behind with this retirement/leave of absence. I’m 11-1 in my last 12 UFC Pay Per View main event fight picks and I’m confident I have this one picked correctly as well. Let’s take a closer look at these fighters and then I’ll unveil my fight pick for UFC 171: Johnny Hendricks vs. Robby Lawler. Robby Lawler has had a roller coaster of an MMA career (22-9). His first stint in the UFC lasted from 2002-2004. After two straight losses, a KO and a submission, he went on to fight in other organizations. Last year he was given another opportunity in the UFC and quickly racked up three victories in a row, two of those coming via vicious knock outs. Robby Lawler has explosive power and can end a fight quickly. Eighteen out of this 22 victories have ended via KO/TKO. If he can get Hendricks to get into a rock em’ sock em’ robot fight, it will line up a good opportunity to unleash and land his KO power. Unfortunately for Lawler, Johnny Hendricks is no dummy. Hendricks is coming off of fights versus two of the smartest, most strategic fighters in the UFC. Hendricks beat Carlos Condit, and most believe he should have gotten the decision over GSP. Johnny Hendricks is 15-2 overall and has really learned how to mix his outstanding wrestling skills with this KO power. Eight of this victories have come via KO/TKO. His wrestling has smothered those fighters he hasn’t been able to KO. His conditioning is top notch and will outwork most fighters. In this fight at UFC 171, there will be exciting stand up trading exchanges! The difference maker in this fight will be that if Hendricks gets in trouble on his feet, he’ll be able to get a takedown and ground and pound to victory. Look for a big KO! But, I’m betting that it will come from Hendricks mixing up this power shots with wrestling to set that up. 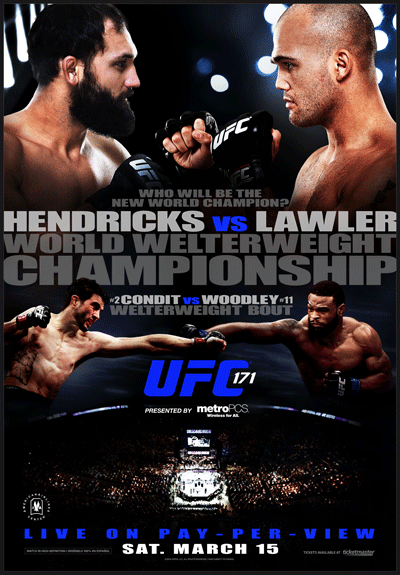 Hendricks will officially take possession of the UFC welterweight champion ship belt.